"A very chocolate mousse cake. 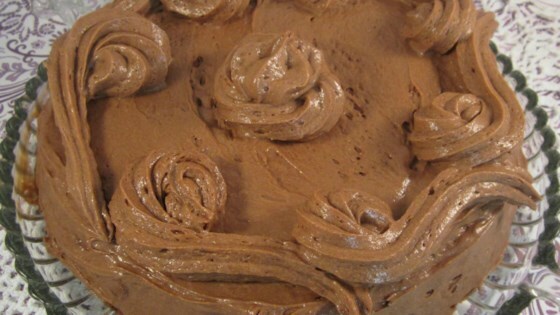 Two thirds of the mousse is baked, with the remainder spread on after baking. Please note: this recipe contains raw eggs. We recommend that pregnant women, young children, the elderly and the infirm do not consume raw eggs. Important: be sure to use only fresh eggs for this recipe." Preheat oven to 300 degrees F (150 degrees C). Butter a 9 inch springform pan, and line bottom with parchment paper. In the top of a double boiler, heat chocolate and unsalted butter, stirring occasionally, until chocolate is melted and smooth. Remove from heat and allow to cool to lukewarm. In a large bowl, beat egg yolks and sugar until thick and lemon-colored. Fold into chocolate mixture; set aside. In a large glass or metal mixing bowl, beat egg whites until stiff peaks form. Fold 1/3 of the whites into the chocolate mixture, then quickly fold in remaining whites until no streaks remain. Pour 2/3 of mixture into prepared pan. Cover and refrigerate remaining 1/3 of mousse. Bake in the preheated oven for 40 to minutes, or until filling is just firm in the center. Allow to cool, then remove from pan and refrigerate 1 hour. Spread remaining mousse over cooled cake and refrigerate overnight. what do you do with the coffee granules?? Confused about the coffee granules, but otherwise a great recipe. If you want a richer flavour, try using dark chocolate (preferably 85% cocoa) in place of the semisweet chocolate. Love the bottom of this....mousse is good but tasted better a couple of days later. Definately very easy to make!!!! Pure chocolate heaven! Instead of spreading the top layer, I put it in a pastry bag and made swirls for a more interesting presentation. I recommend using half the amount of coffee.